Jueri Svjagintsev of Deep Eddy West designs and builds custom furniture. He loves things with shaped legs, carving and lathe work. Jueri got his start from his Russian-Estonian father who always had a shop. Later, Jueri studied painting at the University of Texas, but never lost his love for woodworking. Jueri told us he was hooked with Ashlar’s DrawingBoard™ in the mid-1990’s, a scaled down version of our original Vellum®. He loved how it related to the way he worked with lines and angles on his drafting table, but made it easier to do the precision measurements than reading an engineering scale. Soon Jueri upgraded to Xenon™, our CAD and 3D modeling software, which he describes as a revelation as he began to work with volumetric shapes. He loved the precision of the curves without needing French curve templates. I like to do a rendering so I can rotate this thing. Customers think it’s cool. And then if I’m really into it and have the material at hand, I’ll go out and take a photograph of the actual wood I’m going to use and then project that onto the piece. Jueri did just that for the Art Deco style table in an homage to E.J. Ruhlmann. Xenon was also particularly helpful in getting the arc of the legs just right. As Jueri worked with the commissioning designer, they went through several iterations before settling on this shape conveying the feeling of gravitas to the table top. As Jueri draws in Xenon he virtually builds the part just as he will literally build it later in the shop. This helps him avoid mistakes and prevents him from designing something that can’t be built. He also uses Xenon to create templates that he prints on his tabloid-sized printer, cuts out and then adheres to the piece of wood using contact cement to use as a guide for cutting. Xenon is ideal for artisans like Jueri who require highly flexible, precision 3D modeling without cumbersome constraints. See more of Jueri’s work on his website. 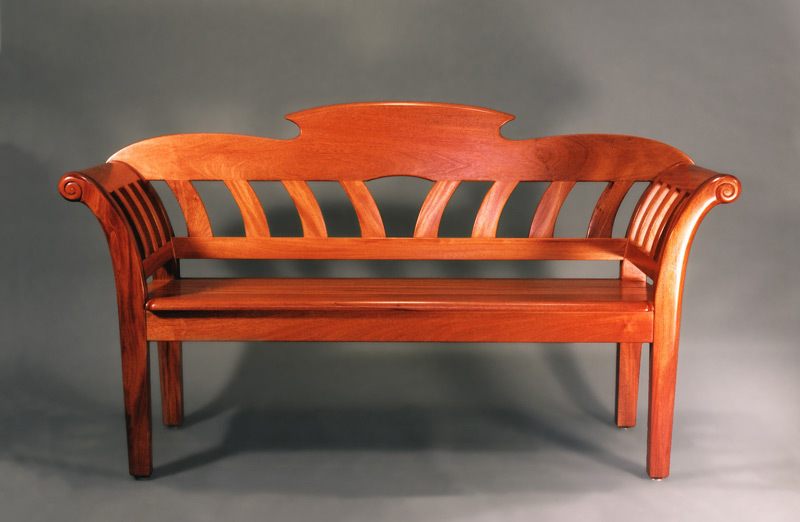 Xenon’s capacity for free-flowing spline curves makes it an ideal tool for designing furniture like this mahogany garden bench. 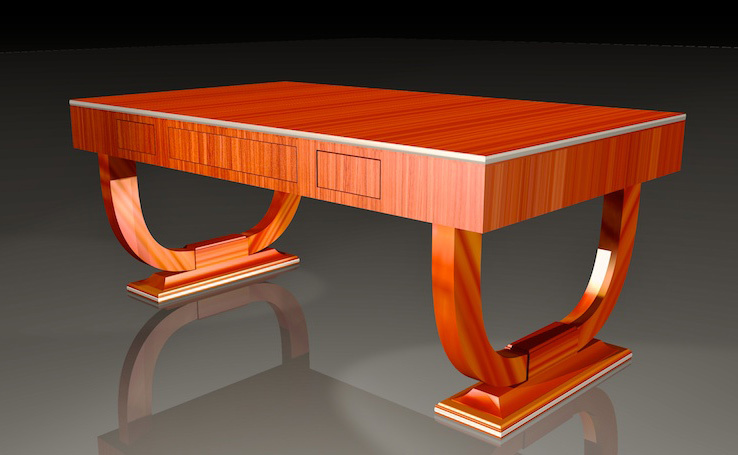 Both above: Jueri often photographs the actual piece of wood and uses it in Xenon renderings like these of the Art Deco style table and this cross. 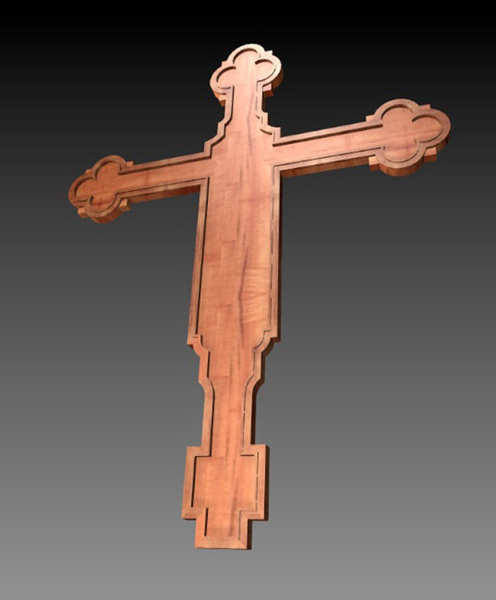 Templates drawn in Xenon are cut out, attached to the wood and used for cutting complex pieces like those of the cross for St. Mary’s Cathedral of Austin.